From the director of MEAN GIRLS and the writers behind HOT TUB TIME MACHINE and THE PRINCESS AND THE FROG comes an entirely harmless "tab A into slot B" kids movie in which all things are predictable and cute and banal and blah. 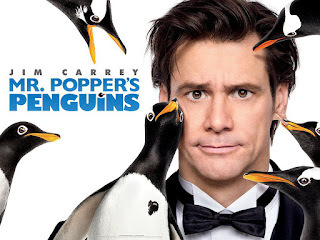 Jim Carrey is typecast as the divorced workaholic with no relationship with his kids who is magically transformed into a warm-hearted, touchy feely dad when he inherits some penguins. Despite the all-star cast (Carla Gugino as the estranged wife, Angela Lansbury as the picky client) the movie just doesn't catch fire. The penguins (real life) just aren't as cute and fun as they are in HAPPY FEET - maybe the screenwriters should've stuck with the Popper-forms-a-circus-troupe story from the original children's book? The plot is entirely predictable. There isn't enough oddball comedy of the kind found in THREE MEN AND A BABY - we need to see Carrey's Popper struggle more with his apartment being trashed instead of just immediately becoming a wonderful pet owner and father. Worst of all, Carrey just looks tired and old and bored. At his best he was an actor so full of energy he could transform mediocre movies into works of comic genius. But now? He's lost that lovin' feeling. There's nothing out and out badly done about the movie, but nothing worth watching either, even as a DVD. MR POPPER'S PENGUINS was released in summer 2011 and is now available to rent and own.